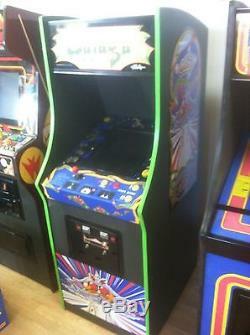 Up for sale we have a completely restored Galaga arcade machine, This is a beautiful machine that works and plays great. The artwork on this machine is all brand new as well as new glass. This has a LCD flat screen monitor with a clear, crisp picture installed. This will eliminate any problems you could have had with the original old CRT monitors that originally came in the machines. Also installed in this machine is a brand new board, all new buttons and switches, and new wiring harness. 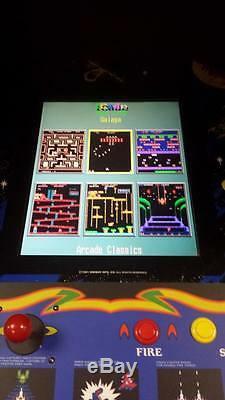 This machine has been upgraded to play Galaga and also 59 other classic games that were popular during that era. 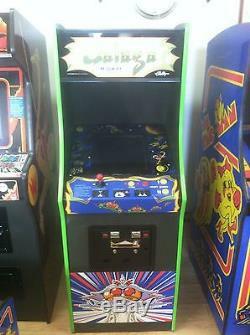 This machine can be set on Free-Play or can be set to accept coins. The games on this machine are. If you are local and live in the area, you are more then welcome to come to our retail store to look at and play this game, as well as many others that we have in stock. We have over 150 machines in stock at our retail store located at in Hanover, PA. If you do not see the machine you are looking for, we specialize in finding them. We will hold any machine we have in stock for a small deposit. We here at Bentzel Amusements would like to thank you for viewing our auctions. 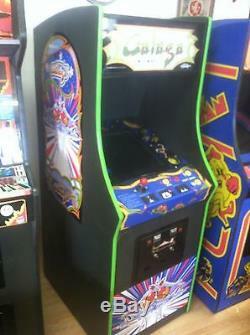 We are a small family run amusement company that specializes in restoring old coin operated machines. The item "Restored Galaga Arcade Machine, Upgraded To Play 60 GAMES" is in sale since Thursday, March 29, 2018.